June 28, 2015. 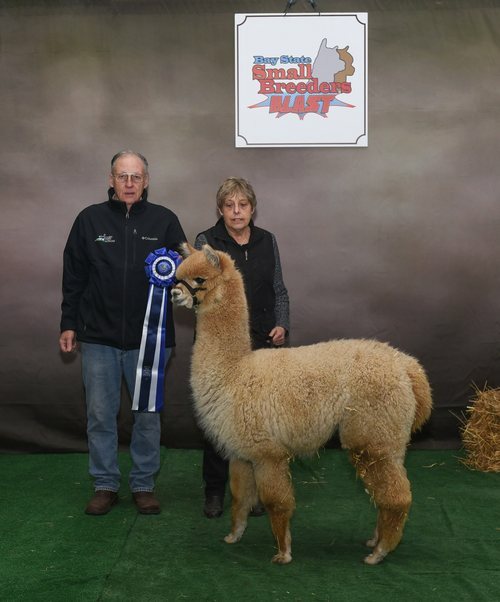 Captain receives Black Male Color Champion and Black Male Reserve Champion at the 2015 AOA Nationals Fleece Show (with over 540 fleece entries). Wow!!! This show stopper is just what we were looking for. Captain Midnight's black fleece exhibits extreme density, brightness and a zipper crimp usually seen in white fleeces. Oh, did I mention it's fine too? Quatrain's Nightengale is one stunning little girl with many champions on both sides of her pedigree. Her sire is a 2X Futurity champion and multiple championship winner. Nightengale has exceptionally long stable, soft handle, excellent density, uniformity and brightness. Her conformity and presence immediately get your attention, in and out of the show ring. She has many show ribbons, bringing home (2) Color Championships, (4) Reserve Championships and many additional ribbons, placing no less than 3rd at any show. We are proud to announce that we now are partners in Stylish Enlightning with Chuck Pesson, Acadiana Alpaca Farm in Rydal, Georgia! Enlightning will be in Ohio June through November and in Georgia from December through May! Let CVAF Zatanna cast a spell over you. Imagine our surprise when Zatanna first enter this world - the product of 5C's Captain Midnight, a true black male and Quatrain's Nightengale, a lovely bay black. Never did we think that the product of this combination would be a light fawn. 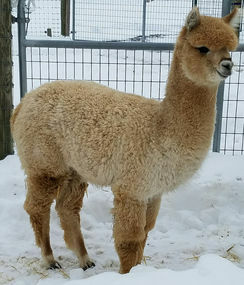 However, Zatanna is also the product of two award winning alpacas, and she inherited great aspects from each side of the genetic tree, color aside. (And does that really matter?) She shows off a beautiful stable length, with lots of crimp, extremely fine and brightness. If you look closely at her picture, you will see a black stripe across her nose. Willing to bet with her background, she will throw some nice color. Zatanna took a 1st place,in her first show, at the new BAY STATE SMALL BREEDERS SHOW. Look for more of this beautiful little spell caster at the 2017 Fall Shows. PM or E-MAIL for more information.